The differential diagnosis of mandibular depressions includes several pathologic entities, such as, odontogenic cyst, simple bone cyst, ameloblastoma, hemangioma, myxoma, central giant cell lesion, fibro-osseous lesions, multiple myeloma, eosinophilic granuloma, benign salivary gland tumors, neurogenic tumors, and metastatic disease. ,,, If SBC have well-defined, thick and corticated borders and oval shape under the mandibular canal in contact with the base of the mandible, differential diagnosis can be easy. However, if they are noticed higher or above the mandibular canal and have no connection with the mandibular base with irregular borders, can cause misdiagnose. Computed tomography (CT) or magnetic resonance imaging (MRI) should be useful for differential diagnose. In this case report, two unusual cases of posterior and anterior Stafne bone cysts are presented with three-dimensional cone-beam CT (CBCT) and MRI findings. A 51-year-old male patient was referred to our clinic for routine dental examination and periodontal treatment. The radiolucent area, which was located at the posterior right molar region of the mandible below the inferior dental canal, had been identified on a panoramic radiograph [Figure 1]. The patient had no complaints concerning this region, and his medical history was ordinary and he had no trauma or surgery history of the jaws. At the right posterior region of the mandible and submandibular region, there was no swelling or abnormality. He had no pain during palpation. Along the distribution of the inferior alveolar and mental nerves, revealed intact sensation. 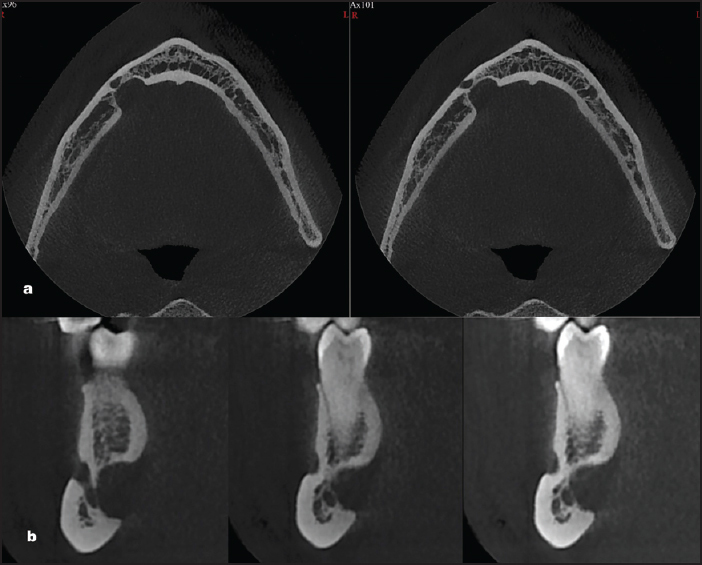 Stafne bone cavity was considered for the radiolucent area located under the mandibular canal but because of the largeness of the lesion and to view its dimensions and borders, CBCT (NewTom 5G; QR, Verona, Italy) was performed [Figure 2]. Examination of the axial images of the CBCT scan showed a mandibular lingual wall defect at the molar region with vestibular extension, which causes resorption of the vestibular cortex [Figure 2]a. The cross-sectional images presented the invagination of the lingual cortex up to the buccal cortex [Figure 2]b. 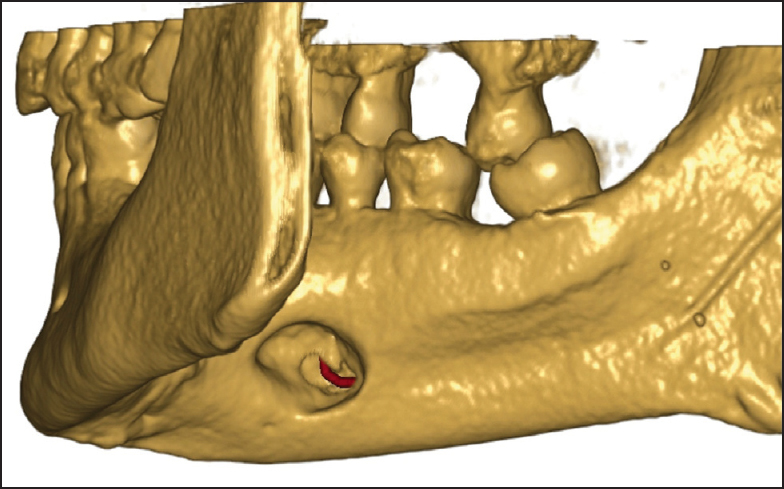 [Figure 3] shows the three-dimensional (3D) CBCT volume rendering reconstructed images of the patient showed lingual bone defect field. In the literature vestibular cortical resorption is an unusual finding so to learn the content of the cavity, MRI was performed. In the defective cavity located in the alveolar arcus two components with different signal intensities were detected. In the T1 fat-saturated, T2 fat saturated, and T1 fat saturated contrasted MRI images, the posterior part of the bone cavity is filled with anteriosuperior part of the submandibular gland. In T1 and T2 sequences, anterior part of the cavity showed hiperintens signals, which is compatible with proteinaceous content in this area. No fatty content was detected in fat saturated sequences in the anterior part [Figure 4]. Final diagnose of the lesion was made as a posterior variant of SBC and the patient was informed about the lesion and scheduled follow-up appointments for every 6 months. A 38-year-old male patient was referred to our clinic for routine dental examination and prosthetic management. A panoramic radiograph of the patient revealed a radiolucent area at the right first and second premolar region of the mandible below the root of the premolars [Figure 5]. The patient's medical and dental history was not contributory. There was no pain and no symptoms such as expansion in this region. Along the distribution of the inferior alveolar and mental nerves, revealed intact sensation. In order to eliminate the diagnosis of the radicular cyst, vitality test was performed, and teeth were vital. We performed CBCT (NewTom 5G; QR, Verona, Italy) scan to the definite, exact location of the lesion and to confirm the diagnosis of the entity [Figure 6]. 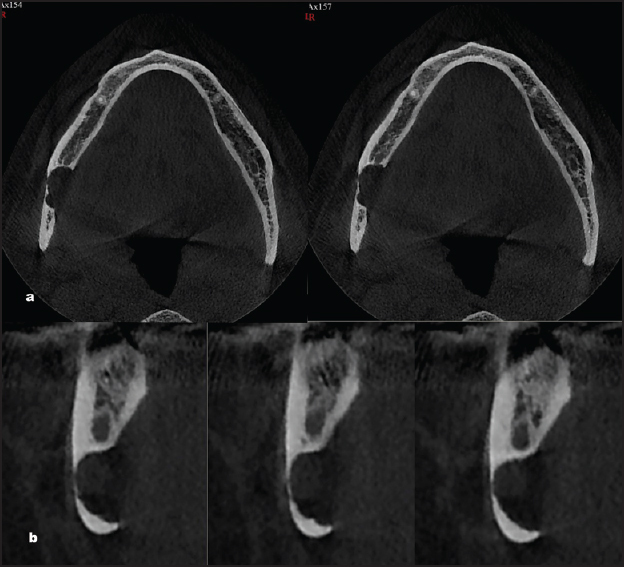 Two-dimensional multiplanar reconstructed CBCT axial images revealed that the radiolucent area located on the anterior region of the mandible lingually with mental foramen relationship [Figure 6]a. The cross-sectional images showed depression of the lingual cortex below the premolar region without any connection with the apex of premolars [Figure 6]b. 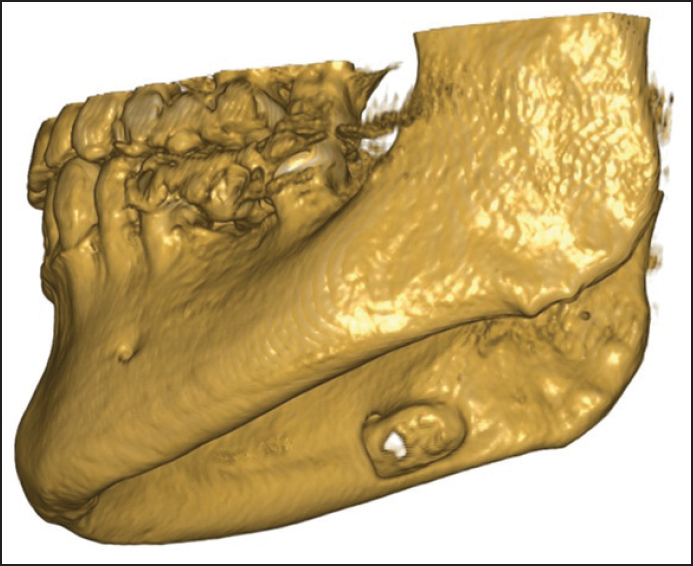 3D CBCT volume rendering reconstructed images revealed a bone defect at the anterior mandible [Figure 7]. Successively, to learn the content of the cavity since this location is not as common as a posterior variant of SBC, MRI was performed. In the T1 fat-saturated, T2 fat saturated, and T1 fat saturated contrasted MRI images, the bone cavity is filled with soft tissue that is, continuous and identical in signal with that of the mylohyoid muscle. This is clearly seen in all types of sequences in various plains in [Figure 8]. Final diagnose of the lesion was made as an anterior variant of SBC and the patient was informed about the lesion and recommended follow-up appointments for every 6 months. Several hypotheses have been offered for the etiology of SBC, and the cause is still controversial. According to Stafne,  bone cavities are developmental failures in the ossification process in the region that is occupied by cartilage. Philipsen et al. declared that hyperplastic or hypertrophic salivary glands pressure on the bone surface can cause the formation of SBCs. Minowa et al. hypothesized that SBC is the result of erosion caused by an acquired vascular lesion or lipoma. Stafne bone defects (SBDs) can include generally salivary glands in accordance with their placement but can also include fat, connective tissue, lymphoid tissue, muscle and blood vessels and even SBCs can be empty. Shimizu et al. reported that SBDs which have a connection with the base of the mandible generally include soft tissues. In accordance with Shimizu et al.,  our first case, the posterior part of the bone cavity was filled with submandibular gland, but anterior part of the cavity was filled with proteinaceous content. No fatty content was detected. In the literature, anterior SBCs commonly contained normal or inflamed salivary sublingual salivary gland tissue. In our second case, the content of the cavity was mylohyoid muscle, which is a rare finding in the literature. Differential diagnose of SBCs from other possible pathologies that may require treatment and imaging technique selection according to case is significant. CBCT and MRI might be serious for a definitive diagnosis. Moreover, especially in cases with critical size to monitor the alterations in size to reduce the risk of fractures follow-ups are very important and the patients should be informed and warned about the condition. 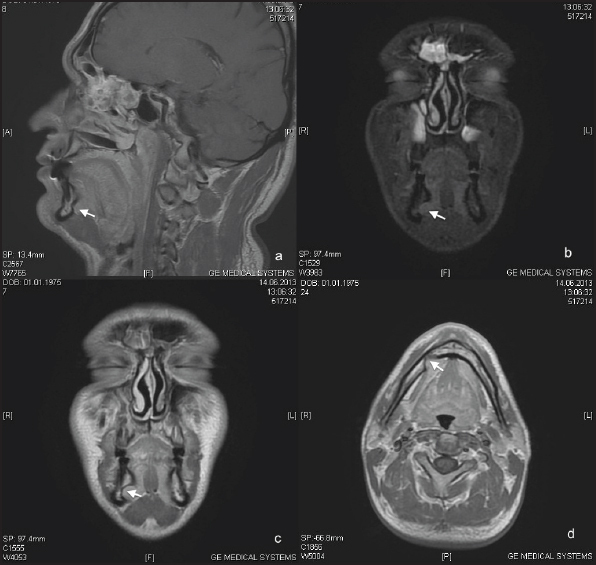 This case report reported on in a poster presentation at The European Society of Head and Neck Radiology (ESHNR) Congress, İzmir, Turkey, October 03-05, 2013. Philipsen HP, Takata T, Reichart PA, Sato S, Suei Y. Lingual and buccal mandibular bone depressions: A review based on 583 cases from a world-wide literature survey, including 69 new cases from Japan. Dentomaxillofac Radiol 2002;31:281-90. Murdoch-Kinch CA. Developmental disturbances of the face and jaws. In: White SC, Pharoah MJ, editors. Oral Radiology Principles and Interpretation. 6 th ed. Missouri: Mosby, Elsevier; 2009. p. 574. Shimizu M, Osa N, Okamura K, Yoshiura K. CT analysis of the Stafne′s bone defects of the mandible. Dentomaxillofac Radiol 2006;35:95-102. Etöz M, Etöz OA, Sahman H, Sekerci AE, Polat HB. An unusual case of multilocular Stafne bone cavity. Dentomaxillofac Radiol 2012;41:75-8. Belmonte-Caro R, Vélez-Gutiérrez MJ, García De La Vega-Sosa FJ, García-Perla-García A, Infante-Cossío PA, Díaz-Fernández JM, et al. A Stafne′s cavity with unusual location in the mandibular anterior area. Med Oral Patol Oral Cir Bucal 2005;10:173-9. Branstetter BF, Weissman JL, Kaplan SB. Imaging of a Stafne bone cavity: What MR adds and why a new name is needed. AJNR Am J Neuroradiol 1999;20:587-9. Drage N, Renton T, Odell E. Atypical stafne bone cavity. Clin Radiol Extra 2003;58:51-3. Stafne E. Bone cavities situated near the angle of the mandible. J Am Dent Assoc 1942;29:1969-72. Ertas ET, Atıcı MY, Kalabalık F, Ince O. An unusual case of double idiopathic ramus-related Stafne bone cavity. Oral Radiol 2013;29:193-7. Minowa K, Inoue N, Sawamura T, Matsuda A, Totsuka Y, Nakamura M. Evaluation of static bone cavities with CT and MRI. Dentomaxillofac Radiol 2003;32:2-7. Reuter I. An unusual case of Stafne bone cavity with extra-osseous course of the mandibular neurovascular bundle. Dentomaxillofac Radiol 1998;27:189-91. De Courten A, Küffer R, Samson J, Lombardi T. Anterior lingual mandibular salivary gland defect (Stafne defect) presenting as a residual cyst. Oral Surg Oral Med Oral Pathol Oral Radiol Endod 2002;94:460-4. Quesada-Gómez C, Valmaseda-Castellón E, Berini-Aytés L, Gay-Escoda C. Stafne bone cavity: A retrospective study of 11 cases. Med Oral Patol Oral Cir Bucal 2006;11:E277-80. Neville BW, Dann DD, Allen CM, Bouquot JE. Developmental Defects of the Oral and Maxillofacial Region. Oral and Maxillofacial Pathology. 3 rd ed. St. Louis: Saunders-Elsevier; 2009. p. 25. Prechtl C, Stockmann P, Neukam FW, Schlegel KA. Enlargement of a Stafne cyst as an indication for surgical treatment - A case report. J Craniomaxillofac Surg 2013;41:270-3. Kao YH, Huang IY, Chen CM, Wu CW, Hsu KJ, Chen CM. Late mandibular fracture after lower third molar extraction in a patient with Stafne bone cavity: A case report. J Oral Maxillofac Surg 2010;68:1698-700. Kopp S, Ihde S, Bienengraber V. Differential diagnosis of stafne idiopathic bone cyst with Digital Volume Tomography (DVT). J Maxillofac Oral Surg 2010;9:80-1. Segev Y, Puterman M, Bodner L. Stafne bone cavity - Magnetic resonance imaging. Med Oral Patol Oral Cir Bucal 2006;11:E345-7.